The Partnership program has been developed for Assyrian individuals, businesses and organizations interested in investing in these online projects. It is with the support of generous and influential partners and sponsors, that we are able to develop these important projects on dedicated server equipment. We promote these partners by advertising their banners through our highly effective website advertising platform. We are selective in choosing companies and organizations to list in our partnership program. This ensures our Internet presence and advertising system are free from distracting marketing clutter that is present throughout the Internet. Please consider becoming a partner if you find this server useful and want to support its continued development. Your partnership will help with systems administration and management, software and hardware updates, Internet bandwidth fees, and other expenses that come up as we develop, protect and promote the various websites on the server. Investing and supporting a professional Internet presence developed by Assyrian activists. Advertising banner images based on the information from your application, business card, and/or other advertising material you provide will be created for your business or organization. The newly created banner image for your organization will be sized at 180 x 150 (shown above) and will be prominently displayed on the main pages of the largest project on this server. Another 468 x 60 advertising banner (shown above) will also be created and displayed on an equal rotating basis with other partners and sponsors within the history, people, television and radio, library, forums, community, and directory sections, including within various categories such as the news, education, government, religion, financial, health, fine arts, and sports archives. As part of the partnership program, your banner will also be integrated within our search system and will be displayed based on a match from users' keywords searched. Example: this is an actual search result for a “banquet hall” displaying the advertising banner of one of our current sponsors relating to the search words. We will build a permanent Internet homepage for your business or organization on our server, with links to your website if available, similar to our existing partners. For your convenience, if you decide not to renew your partnership, this homepage will remain online. However, the banners will be removed from our advertising and search systems. We appreciate and value your partnership, and hope we can continue to develop these website projects with your partnership support. or browse the information section to learn more about AIM. Are you an Assyrian individual, and/or part of an Assyrian organization or business? Would you like to become a partner with a yearly financial investment in this server project? 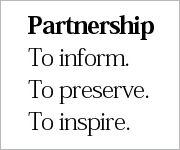 Please complete this Partnership Application to begin the partnership process.